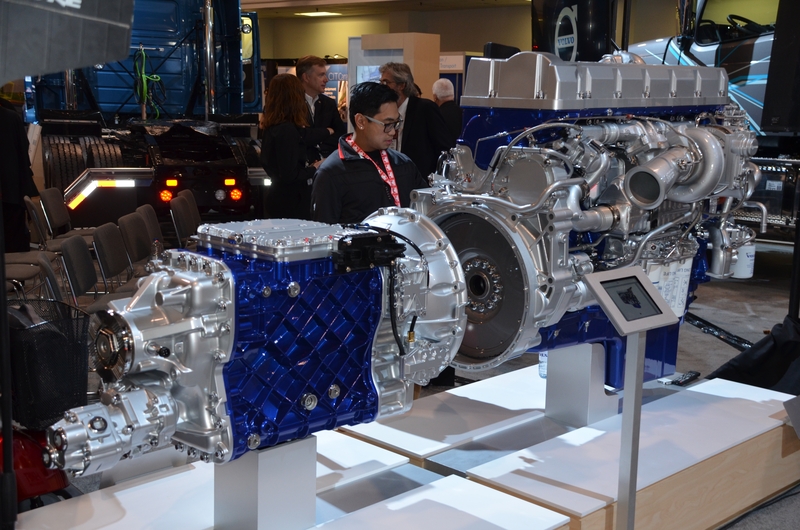 April 15, 2016 – Volvo Trucks presented its lineup of 2017 powertrain upgrades to help kick off the 2016 Truck World Show at the International Centre in Mississauga, Ont. President of Volvo Trucks North America Goran Nyberg opened the event by announcing record sales figures for the company in both the Canadian and U.S. markets. In Canada, Volvo had a retail share of 16.3 per cent in 2015, up from 15.4 per cent in 2014. For the U.S. market, the company’s retail share was 12.4 per cent, up from 12.0 per cent in 2014. For Volvo Power presentation, all three components saw record market share in 2015, with 92.6 per cent for Volvo Engines, 82.7 per cent for I-Shift and 27.6 per cent for XE Packages. But while the market penetration information is good news for the company, the bigger news for those in attendance was the introduction of three significant engine upgrades for 2017: the D11, D13 and D16 engines. The new D11 is upgraded to 425 horsepower while still providing a 2.2 per cent improvement in fuel efficiency. Additional upgrades include Volvo’s new wave pistons, which increase compression 16:1 to 17:1, along with a new two-piece valve cover. Production of the D11 begins in January of 2017. The new 455hp D13 features an increase in torque to 1,850 lb. ft., along with a 2.5 per cent improvement in fuel efficiency. The D13 also comes with the new wave pistons, as well as a two-speed coolant pump on XE models. Production on the new D13 begins in October of this year. There is also a new D13 with turbo compounding that will be available in mid-2017. That version of the D13 improves on fuel efficiency by 6.5 per cent. The key element of the D13 turbo is that it recovers waste heat, transferring up to an additional 50hp to the engine. For the new D16, there are no changes from the GHG 2014 engine. However, the D16 does maintain the iron-zeolite catalyst, which eliminates the need for sulfur regenerations. The new D16 starts in production in January of 2017. In addition to the engine upgrades, Volvo is also introducing a new version of the I-Shift, as well as I-Shift with crawler gears. The new I-Shift includes upgrades to both hardware and software. On the hardware side, torsional dampening, clutch durability and PTO bending torque have all been upgraded, as well as improvement of the countershaft brake. On the software side, the new I-See software provides an intelligent cruise control feature. Production begins in October. The new I-Shift with crawler gears allows the driver to go as slow as 0.6mph while also providing increased maneuverability and up to 220,000 GCV. It is available for all Volvo models with Volvo engines, and begins production in October of this year. Coming off a record year in North America, the hope for Volvo Trucks is that these new innovations can help drive their market share is a definite region of growth for the company. Why don’t we think more about trees in Ontario?